Owned and operated by the City of Timmins, our airport is one of the largest airports in Northern Ontario. The Airport is a convenient gateway to Toronto and northern communities. 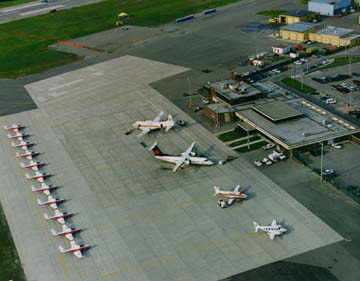 The airport serves as an administration and maintenance centre for Air Creebec; a base for recre ational, business and private operators. It also serves as an aircraft maintenance and emergency medical transportation hub. The MNR uses the airport as a district base for fighting forest fires. The Timmins Airport is also a growing hub for air cargo. Serving more than 200,000 passengers annually, the Timmins Airport is approximately 11 kilometers north of the city business district. The airport has two runways (main runway is 6,000 feet and secondary runway is 4,900 feet), a flight service station, precision landing aids and a 24 hour weather reporting operation. World fuels stations are located at the airport for full aviation and aircraft servicing requirements. The Timmins Airport serves a much larger market than the City of Timmins. Based on its strategic location in the heart of Northeastern Ontario, Timmins has become the focal point for transportation and communications as well as some government services for the region. Timmins is a hub airport serving the air traveler and cargo needs of an encompassing market area of 160,000 people. Parking at the airport is fully automated. You'll pick up your parking ticket when you enter the parking lot. When you're ready to leave, you have two payment options. You can pay by cash, debit or credit card (Visa, MasterCard or American Express) at the Pay on Foot station in the Arrivals area of the terminal building or pay by credit card on your way out of the lot. (cash and debit not accepted at exit gates). Click here to view/download the parking map. Arriving passengers can be met at the Arrivals doors at the north end of the building. Please do not leave your vehicle unattended. If you plan on going inside the terminal, please park your vehicle in the parking lot. Please note: 1 Hour FREE parking. Departing passengers can be dropped off at curbside at the "Kiss ‘n Fly" area by the Departures doors at the south end of the terminal. This area is for drop off only. Please do not leave your vehicle unattended. It is a FIRE ROUTE and vehicles will be tagged and/or towed. Please use the parking lot if you are escorting a passenger into the terminal. Please note: 1 Hour FREE parking. If your luggage does not arrive or is damaged, please contact your airline directly. Carts are conveniently located by the baggage claim, $1.00 per cart. Return your cart we return your loonie! Prior to packing for your flight, check the list of prohibited items for checked and carry-on luggage on the Canadian Air Transportation Security Authority (CATSA) website or call 1-888-294-2202. Leave it with pre-board screeners and they will dispose of the item. Use the Mail-It-Home Program (ask information desk). Other Services – ATM, Pay Phone, Lost and Found/Information (Security Office), Baggage Carts, Washrooms, Vending Machines, Work Stations, Wi-Fi. Timmins Victor M. Power Airport regulations fees are reviewed on an annual basis. Download the Airport Regulations and Fees Link . Click here to check Timmins Weather (opens in new window).